Church of the Foothills. Sunday, April 8 Easter! 6:30 AM Sunrise Service. 8:00 AM Pancake Breakfast. 9:15 AM Regular service. Sermon: “The Never Ending Story” Open Communion Served. Located at 19211 Dodge Avenue, in Santa Ana. 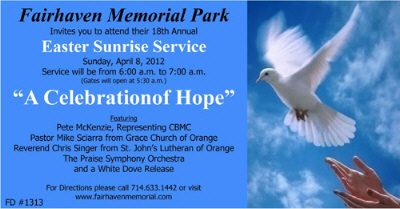 Fairhaven Memorial Park in conjunction with C.B.M.C – Orange County, invite you to attend the 18th Annual Easter Sunrise Service, Sunday, April 8, 2012 from 6 am to 7 am. Gates open at 5:30 am. Located at 1702 Fairhaven Avenue, in Santa Ana. First Baptist Church of Santa Ana. Traditional Easter Service at 9 am. Free breakfast at 10 am! Contemporary Service at 11 am. Easter Egg Hunt and Story at 10:15 am. Spanish Service at 11 am. Located at 1010 West 17th St., in Santa Ana. First Congregational Church of Santa Ana. Easter service from 9 am to 10 am. Located at 2555 Santiago Street, in the Park Santiago Neighborhood, in Santa Ana. Mars Hill Church @ The Observatory Orange County, located at 3503 South Harbor Boulevard, Santa Ana. Come celebrate the resurrection of Jesus Christ with Mars Hill Orange County on April 8 at 9 and 11:15am. We’re celebrating Jesus’ resurrection with baptisms, a sermon from Pastor Mark, and music led by Worship Director, Dustin Kensrue. Our Lady of La Vang Catholic Church. Easter Mass services all day, starting at 6:30 am through 6:30 pm. Located at 288 South Harbor Blvd., in Santa Ana. St. Joseph Church. Easter Mass services all day, starting at 7 am. St. Peter Evangelical Lutheran Church. Easter Sunday Service, Sunday, Apr 8 9:00am, at , 1510 N. Parton St. Santa Ana, CA 714-542-6781. Templo Calvario, April 8th, Easter Sunday Service. Jesus has risen from the dead and has gone up to heaven. 9 AM is our Spanish service and 11 AM is our English service. Word of Life Church Church Services and Giant Easter Egg Hunt, located at 625 N. French St., in Santa Ana. Spanish Service at 8:30 am, English Services at 9 am and 10:30 am. If I missed YOUR church service email me at editor@newsantaana.com, or post it as a comment below. God bless! « Why doesn’t Santa Ana turn Easter Cruising into our L.B. Grand Prix?